When you see the real impact that groups working together can have, it is impressive to say the least. This morning we met Paula Deen, well known chef, restauratuer, and spokesperson. 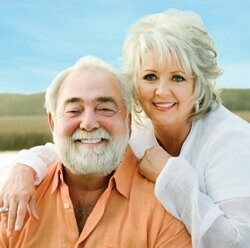 She has been partnering with Smithfield meats in their effort to end hunger in the United States. The reason for her visit was for their donation of 40,000 pounds of meat products to Feeding American West Michigan Food Bank. Perhaps what impressed me most, was her personal connection to those struggling to provide food for their families. She was once “there”. As she explained the goals Smithfield and Feeding America has, she was moved to tears that this problem still faces so many. As a company, Awareness Home Funding is structured to help organizations like Feeding America help others. As individuals, we may not have much impact. But, as Paula indicated, working together we surely do. When we are able to help you, your friend, their colleague, and that person’s family member that single donation from each loan suddenly has tremendous impact. The power of one telling one. Tell someone you know and let us help you help them. This entry was posted on January 21, 2010 at 10:10 pm and is filed under All Articles, Charity Spotlight. You can follow any responses to this entry through the RSS 2.0 feed. You can leave a response, or trackback from your own site.